Writing Creatively: Is Your Writing Choppy? You have talent, you have topic ideas galore, and your creativity is oozing from your pores. Maybe you just started writing a blog, or maybe you’ve been writing one for years, but somewhere deep inside, even though you know you can write, even though you know you have talent, you feel that something is missing and that your writing could use some improvement. The problem might be a lack of transitions, especially if your writing seems stilted and choppy. Writers need to smooth out the bumps in their copy in order to make it more easily readable. How? With transitions! Transitions help readers glide through your writing without hesitation. Transitions are the bridges that link your paragraphs together. One comic on a recent episode of Last Comic Standing noted that he, like so many writers (myself included), had a problem with transitions and, noting the benefit of using good transitions, consciously employed them into his act. Instead of bouncing from one topic to another, this comic skillfully employed the use of transitions and improved his routine immensely. Whatever you write – comedy, fiction, or nonfiction – your job as a writer is to take your reader (or, in the case of comedy routines, your audience) from one paragraph to the next – fluidly. Why? 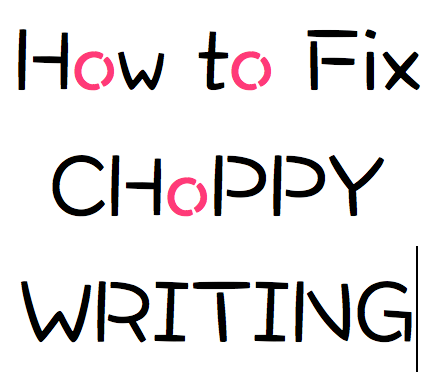 Because choppy writing trips up your reader. If after a couple of sentences into reading your work, your reader suddenly stops, that reader’s mind is attempting to connect the dots and find the relationship between one paragraph and the next. You, as the writer, were supposed to supply that bridge. Now your reader is either floating in that space between paragraphs, begging for soft ground upon which to land, or running back to the last paragraph to find what might be missing. When you don’t smoothly transition from one paragraph to the next, your readers feel as if they’ve been riding a roller coaster that halted halfway up the incline – seconds into the ride. Readers want to continue the ride, but you haven’t laid the groundwork for them. Your readers shouldn’t have to make that leap themselves. They shouldn’t have to struggle through your writing. Reading what you’ve written should be enjoyable for them. So how do you transition from one paragraph to the next? By providing a connection to the previous paragraph. You can seamlessly weave your paragraphs together a number of ways. One of those ways is by using terms that pull your writing forward. Read what you’ve just written. Do you find yourself suddenly hesitating? Does the preceding paragraph appear to be almost an entirely different topic? Look at those two paragraphs again and ask yourself how you can bridge them together. Use such words or phrases as, “In addition to,” “Another thing,” “Furthermore,” “In contrast,” “Otherwise,” etc. Transitions enable you to create a fabric of content that appears to be (as it should be) one cohesive piece of work. Your goal as a writer is to prepare your writing in such a way that your readers feel comfortable reading what you’ve written. For My 21 BEST Writing Tips, please click the link. If you would like to read more from this author, please click HERE! And thank you for visiting! You have such wonderful advice here. A really good site!